Sunday to Thursday – £299. Friday and Saturday – £399. After Band fee. – £250. We set up with the band at the start of the night. Its still the same large show but less hours for us to play. Ceremony Music or wedding Music – £100. No matter if its a 18th, 21st, 30th, 40th, 50th, or 60th Birthday we can cater any musical tastes. Take our photo booth and disco for £650. The Wedding Disco charges one price for an evening’s work. From your meal ends until 1am. Normal playing time is 5hrs to 7hrs. 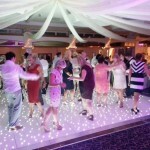 We supply a large disco with the best sound and lighting effects that will fill every room. Whatever the size of stage, we will fill it. Check the gallery for some pictures of past events. but we are definitely the best! If its in Ireland We will travel. We have been the recommended entertainment for Tullyglass House Hotel for 7 years now. 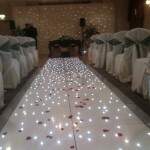 Need to speak to a person then call us anytime to discus your child’s party, birthday party or wedding. We will be very happy day or night to help you find the answers you require.